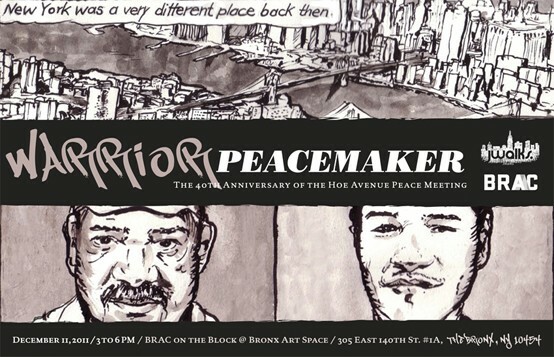 Bronx River Art Center (BRAC) and JWalks are excited to present Warriors/Peacemakers: Activists and Artists Celebrating the 40th Anniversary of the Hoe Avenue Peace Meeting as part of our Shifting Communities Roundtable Event Series. This event will be held on December 11th from 3 to 6pm at 305 East 140th St. #1A, Bronx, NY 10454. This December marks the 40th anniversary of The Hoe Avenue Peace Meeting, a gathering of New York gangs that led to a truce and inspired similar gatherings in other cities throughout the US. Benjamin Melendez, the meeting’s initiator and former leader of the Ghetto Brothers (South Bronx Puerto Rican Gang), will be in attendance along with fellow Bronx artists and activists connected to this historic event. The Warriors/Peacemakers Roundtable will include an art exhibition featuring sketches from the work-in-progress graphic novel "Warrior/Peacemaker: The Story of Yellow Benjy," by Julian Voloj and Claudia Ahlering. A video screening of the trailer introducing the forthcoming documentary "Rubble Kings" by Shan Nicholson and Ben Velez will be shown. Additionally, there will be a panel discussion featuring former Ghetto Brothers, Benjamin Melendez and Bill Leicht; Break Dance/Hip Hop Pioneers Joseph Mpa ("Cold Crush Brothers") and Jorge "Fabel" Pabon ("Rock Steady Crew"), filmmaker Henry Chalfant ("Style Wars", "Flyin' Cut Sleeves") and Joe Schloss, the author of "Foundation: B-Boys, B-Girls and Hip-Hop Culture in New York" (2008). The Shifting Communities Roundtable Series has transformed our temporary gallery into a revolving architectural space designed by Bronx artists and NY-based art collectives for community meetings, events, and workshops. Based around a sculptural, modular roundtable, all programming in this series is dictated by the community through an open and democratic sign-up process and online community calendar. Additional information and images about this series and any of the events is available by emailing Chad Stayrook at cstayrook@bronxriverart.org.